Earlier this year, Los Angeles became one of the first cities in the country to roll out ShakeAlert – a dedicated earthquake early warning system. Advanced warning of an earthquake has long been a goal for everyone from seismologists to local governments. Especially in cities like Los Angeles, located along the notorious San Andreas fault. But what about cities like Seattle? “It wasn’t until about 30 years ago that geologists discovered evidence of past megaquakes and tsunamis in the Pacific Northwest,” says Sandi Doughton, Seattle Times science reporter and author of Full-Rip 9.0: The Next Big Earthquake in the Pacific Northwest. Scientists discovered that Seattle sits along the Cascadia Subduction Zone – a tectonic zone running from northern California to Vancouver – and a system of shallow faults that crisscross the Puget Sound region. At the Seismological Society of America’s 2019 Annual Meeting, Doughton will join a panel of earthquake early warning experts to talk about the ShakeAlert earthquake early warning system, how it functions and when it’s expected to be implemented in the Pacific Northwest at a public town hall meeting. Massive earthquakes in Seattle have been rare, but they have certainly made their mark. 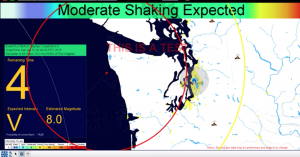 “Past events like the 2001 magnitude 6.8 Nisqually earthquake have been very damaging and caused injury, and the Cascadia subduction zone could produce a magnitude 8-9 quake as well,” says Harold Tobin, director of the Pacific Northwest Seismic Network (PNSN) at the University of Washington. The ShakeAlert system works by detecting the fast-moving, but less-powerful P-waves that radiate from an earthquake. You might not feel P-waves, but a distributed network of sensors does. ShakeAlert uses this information to quickly estimate the earthquake’s location and magnitude, then send out an alert through an app or public warning system before the more powerful – and more damaging – S-waves arrive. Depending on the location of the earthquake’s epicenter, this warning can range from minutes to just a handful of seconds before shaking starts. While a few seconds might not seem like enough time, it’s often enough to at least take cover. “Most earthquake injuries are due to falling objects and can potentially be prevented by just taking cover,” says Tobin, who has experienced firsthand how effective early warning systems can be. In 2015, while at a conference in Japan, an earthquake alert went off. Beyond the immediate risk an earthquake poses to civilians, risks to critical infrastructure are another area of concern. Companies such as Bothell, WA-based RH2 Engineering have been working on ways of using ShakeAlert to protect infrastructure when shaking starts. “We’re assisting water utilities in implementing the ShakeAlert signal to take protective actions at water facilities such as closing valves and powering off equipment,” says Rachel Lanigan, an engineer and ShakeAlert program manager at RH2 Engineering. Lanigan’s fellow program manager Michele Campbell will speak at the meeting about how RH2 is utilizing ShakeAlert. Joining Doughton, Tobin and Campbell will be Scott Miles, an expert in disaster risk reduction in the Department of Human Centered Design and Engineering at the University of Washington. Miles will discuss a study he was a part of that investigated the performance and user experience of Mexico City’s earthquake early warning system and what we might expect from a similar system in the United States. Douglas Toomey, co-director of the Pacific Northwest Seismic Network at the University of Oregon, will hold a question and answer session for members of the public to ask questions and share their views. The town hall meeting takes place 6–7:30 p.m. on Tuesday, 23 April at The Westin Seattle in rooms Cascade I & II. The meeting is free and open to the public. Attendees are encouraged to bring any questions they may have about earthquake early warning systems. For more information, visit https://www.seismosoc.org/annual-meeting/events/town-hall-meeting/.